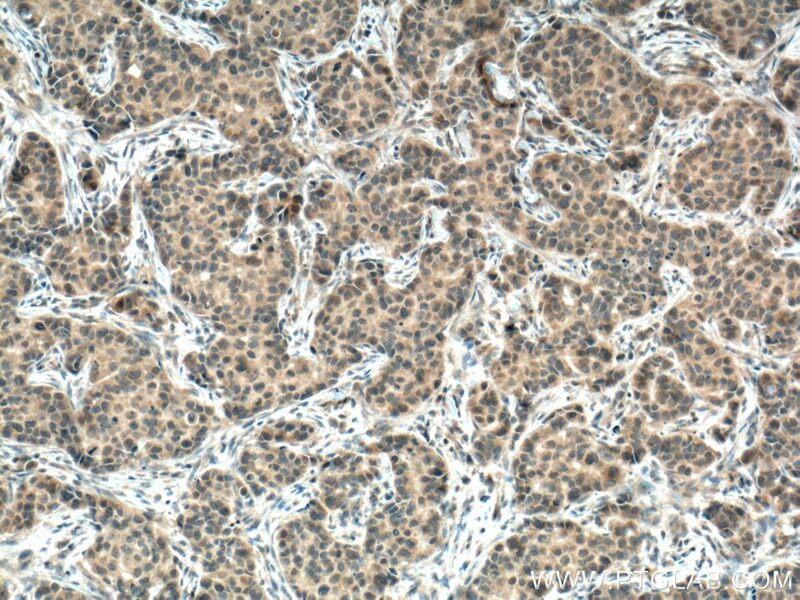 Immunohistochemical analysis of paraffin-embedded human breast cancer tissue slide using 17856-1-AP (USP21 antibody) at dilution of 1:200 (under 10x lens) heat mediated antigen retrieved with Tris-EDTA buffer(pH9). 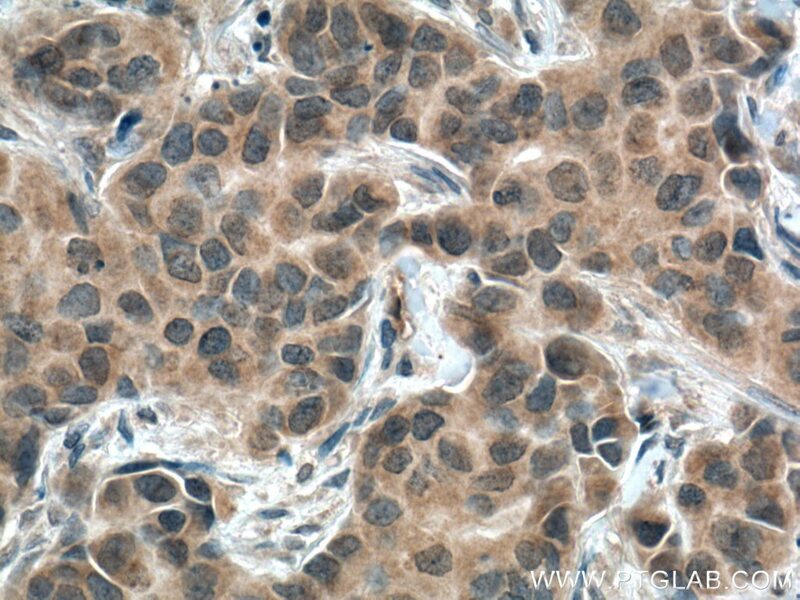 Immunohistochemical analysis of paraffin-embedded human breast cancer tissue slide using 17856-1-AP (USP21 antibody) at dilution of 1:200 (under 40x lens) heat mediated antigen retrieved with Tris-EDTA buffer(pH9). USP21(Ubiquitin carboxyl-terminal hydrolase 21) is also named as USP23.The USPs belong to a subclass of the protein-deubiquitinating enzyme (DUB) superfamily that are categorized into five subclasses based on their ubiquitin-protease domains in the human genome and have been shown to be involved in a broad range of biological activities(PMID:19910467). 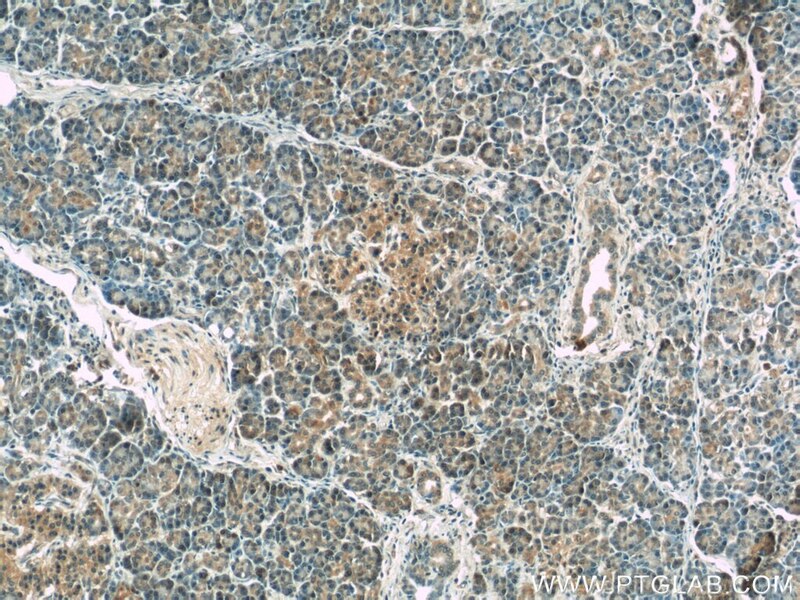 USP21 is expressed at different levels in the tissues examined. 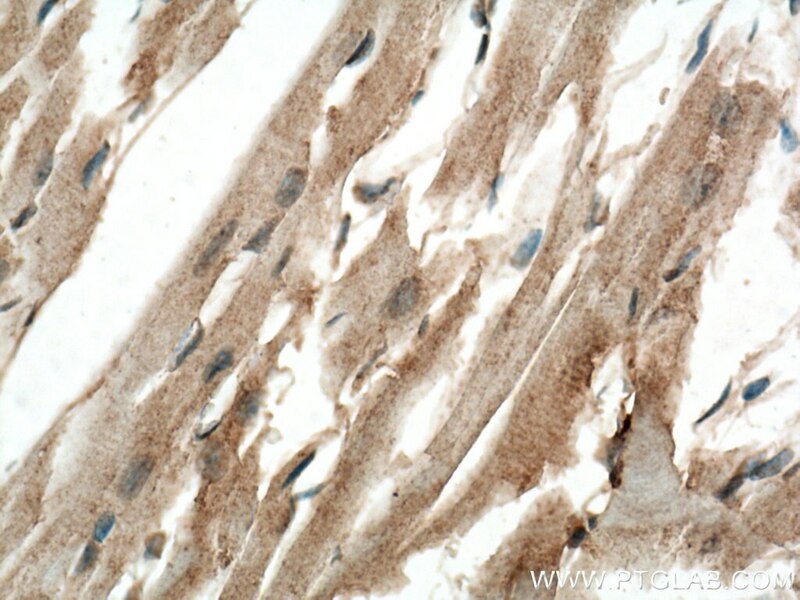 The highest level of USP21 expression is found in the heart, pancreas, and skeletal muscle. 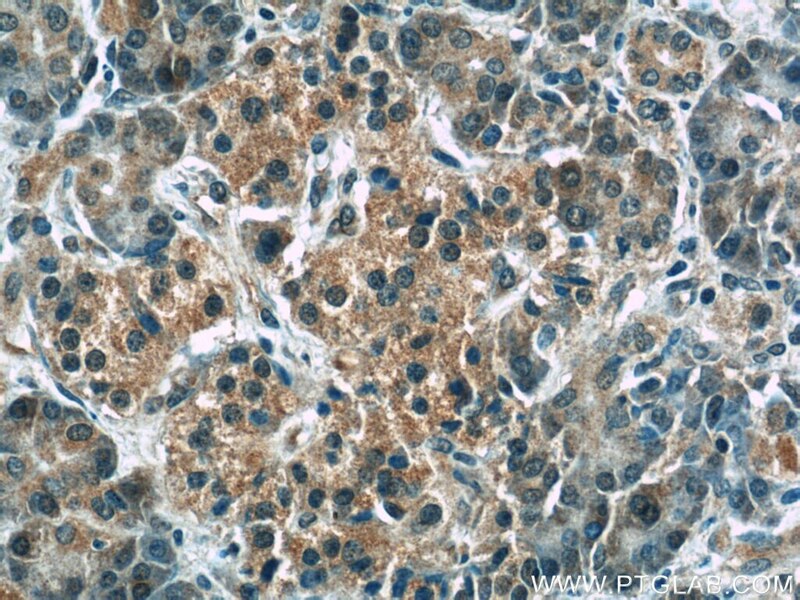 USP21 messages could also be detected in the brain, placenta, liver, and kidney but are very low in the Lung through the northern blot(PMID:10799498). 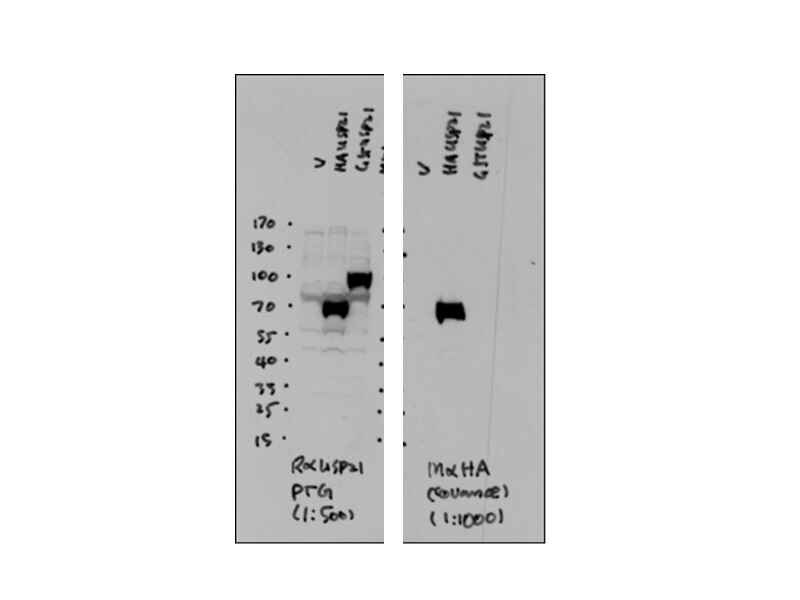 WB result of anti-UPS21 (17856-1-AP, 1:500) with HA-UPS21 and GST-UPS21 by Dr. Xicheng Mao. Immunohistochemical analysis of paraffin-embedded mouse heart tissue slide using 17856-1-AP (USP21 antibody) at dilution of 1:200 (under 10x lens) heat mediated antigen retrieved with Tris-EDTA buffer(pH9). 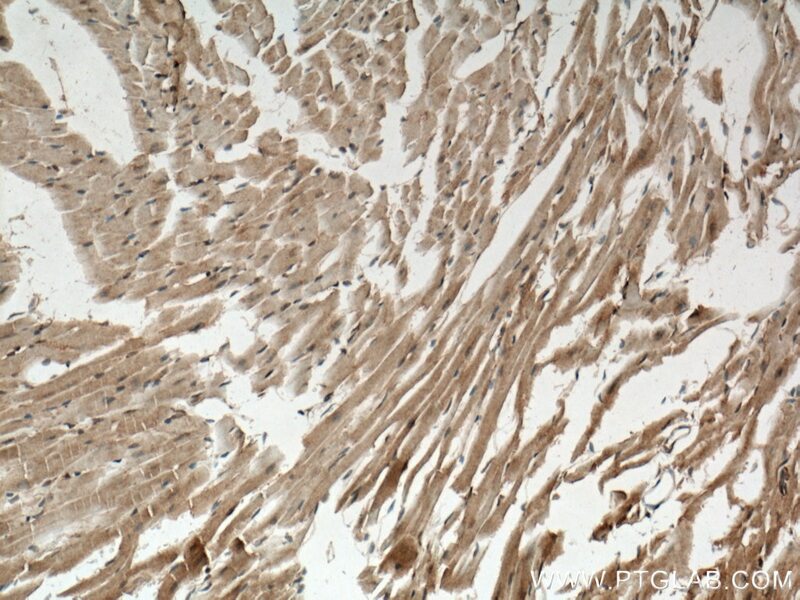 Immunohistochemical analysis of paraffin-embedded mouse heart tissue slide using 17856-1-AP (USP21 antibody) at dilution of 1:200 (under 40x lens) heat mediated antigen retrieved with Tris-EDTA buffer(pH9).